Edea figure skates were produced by the skate boot makers that developed Risport skates. Made in Italy, Edea has great style, modern materials and craftmanship. 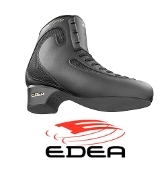 Edea skates are lightweight, moldable to fit the foot, lightweight and developed to help the skater reach amazing heights in their jumps. Each Idea boot shows quality and elegance in it's design. From the waterproof soles to the swarovski crystals, Edea figure skates are the leader in the skating world. Edea Figure Skates are beautifully designed high quality skates and boots that are worn by U.S. and World Champions. They are lighter, will help you jump higher and go faster than ever before. Mens Edea Figure Skates and mens edea figure skating boots are a great choice for skaters from beginners to the more advanced. Womens Edean Figure Skates and Womens Edea Figure Skating Boots are the choice of many ladies skating champions. Edea skates start with the skater. While thinking about the needs of the skaters, the designed tried to make a perfect boot that would deliver the ultima skating performance. The lightness of the boots come from the modern materials they are created with. Lighter means faster, higher jumps, longer jumps and more air time. Lighter is better and means better skating. Edea skates are worn by champions all over the world. Edea stars with the Motivo. This is a skate that is best for recreational skaters. It will help you get out on the ice with good support. The next boot up is the Edea Overture. The Idea Overture is developed for skaters who want to take skating lessons. Next is the Edea Chorus. The Edea Chorus was developed for skaters starting jumps. 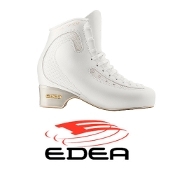 The Edea Flamenco Ice is the best know ice dance boot all over the world. The Edea Concerto was developed for skaters who are working on their single jumps and some beginner double jumps. The Edea Ice Fly will support all single and double jumps. You can't overboot in an Edea. The Ice Fly is the most popular boot in the world among skaters. The Edea Piano is the top of the line figure skating boot developed by Edea. It will support all double, triple and quad jumps.